The A. Sediba cranium belonged to a juvenile that lived nearly 2 million years ago. Photo by Brett Eloff, courtesy of Wits University. Emory anthropologist Dietrich Stout will spend part of his summer vacation analyzing the skull of a newly discovered hominid species, dating back to the pivotal period when the human family emerged. "This is a remarkably intact skull of a potential human ancestor from right around two million years ago, when we think the origin of our own genus was happening," Stout says. "It's exciting to learn that such a thing exists, let alone to be asked to work on it." Stout was chosen to join the team of researchers on the project due to his expertise on early brain function, particularly the relationship between the use of stone tools and brain evolution. "Whatever story this skull has to tell, it will be interesting," Stout says. 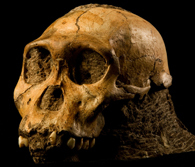 The fossilized skull was found last year in the Cradle of Humankind, South Africa. Paleoanthropologist Lee Berger, from the University of the Witwatersrand, and fellow researchers have since recovered skeletal remains of several other individuals belonging to the new species, named Australopithecus sediba. Scientists estimate that the individuals lived 1.78 to 1.95 million years ago, when early species of the human genus Homo existed along with species from the more ape-like genus Australopithecus. Attempts to narrow down the emergence of the human line have "always been a bit messy," Dietrich says, noting that multiple candidate species have been identified - often from incomplete remains and sometimes based on a single individual. The numerous pieces emerging from the A. sediba site, however, already represent at least two individuals and are fitting together like a puzzle, giving researchers a clearer view back in time. Watch a report on the discovery by the CBS program 60 Minutes. Sediba means "source" in Sotho, and A. sediba shows an interesting mix of characteristics. "They have primitive, ape-like long arms, but much more human-like bi-pedal legs and posture," Stout says. "The skull looks to have the capacity for the size of brain size you'd expect to find in a modern chimpanzee - or perhaps an early human ancestor. It appears to be on the cusp, giving us the potential to tease apart some of the really interesting questions about what got human brain evolution started, such as whether the size or structural changes were first." Stout will join other members of the team in Johannesburg and examine the fossils first hand. High-tech scans of the skull fossil are being used to create a virtual, 3-D "cast" of the cranium. "It's not like working with an actual flesh brain, but it will give us information about the size and volume of what was inside the cranium, and some of the features of the surface morphology," Stout says.